Bring elegance and minimalism to any bathroom with floor to ceiling walls of CaesarStone. Achieve a natural look with a hardwearing stone that is beautiful, easy to maintain, and extraordinarily durable. The floors, walls and custom made vanity top in this modern bathroom are clad in slabs of CaesarStone in Snow. Joins in each slab are beautifully mitered by a stonemason creating an attractive feature. The slabs can be cut and used for lining all wall surfaces and shower recesses, giving a seamless look with less grout to clean than traditional bathroom surfaces. The floors, walls and custom made vanity top in the modern bathroom pictured here are clad in 3m x 1.4m slabs of CaesarStone in Snow. Large slabs mean few joins requiring no grouting which minimises cleaning. CaesarStone’s low maintenance requirements take the stress out of keeping your bathroom looking its best at all times. Maintaining the rich, lustrous gloss finish in your CaesarStone bathroom simply requires washing with warm soapy water. The CaesarStone finish will not lose it’s sheen with normal usage. The surface won't stain with the normal lotions and cleaners used in a bathroom. Additionally, the virtually non-porous surface boasts a 0.002% absorption rate, which means an end to water damaged tops and bath surrounds. CaesarStone has a large range of colours, textures and finishes and is backed by a 10 year limited warranty. All quartz surfaces are scratch, stain and heat resistant. 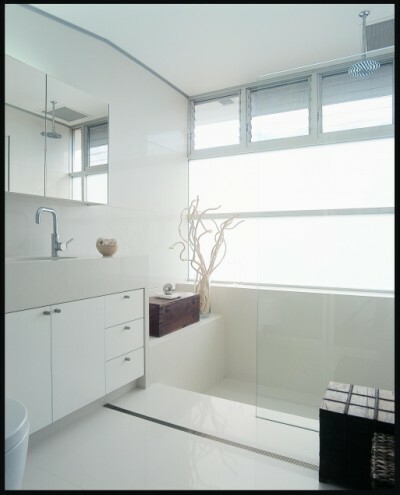 Mould and mildew resistant, CaesarStone is ideal for both residential and commercial bathroom projects. Visit one of the 5 CaesarStone showrooms in Australia to view the complete range.